After closing out last weekend with a decisive win over Peterborough, the Ottawa 67’s are back in action this weekend for a busy stretch of three games in three days. With the 6-1 win over the Petes, the 67’s now sit seventh in the OHL’s Eastern Conference but just three points back of sixth-place North Bay and four back of Oshawa in fifth. With the standings as tight as they are, the fact that Ottawa will play both of those teams this weekend – North Bay at home on Friday, Oshawa on the road on Sunday – along with the fourth-place Kingston Frontenacs, makes this a pivotal stretch of action. 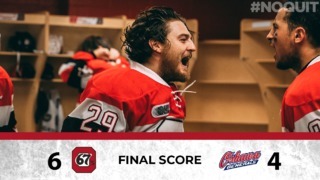 Sunday’s tilt against Oshawa also marks a rare road game for the 67’s as the club will have played their previous six at home when they head to face the Generals. Following that game, the club will be back at The Arena at TD Place for another stretch of five-straight home contests. This game marks the second of four meetings between Ottawa and North Bay this season. Ottawa got the win in their first meeting back on October 12 in North Bay as former Barber Pole Mathieu Foget scored the overtime winner. The Battalion are riding a hot streak that has seen them win seven of their last eight games, including an overtime decision over Saginaw in their last outing. Two teams that are no strangers to each other meet for the fifth time this season on Saturday with both having won two games each. 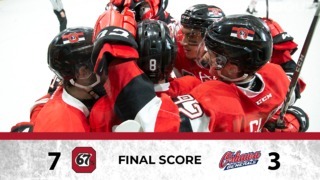 The 67’s have dropped their last two decisions to Kingston after winning the first two against the Frontenacs. The Frontenacs will play Oshawa the night before so both Ottawa and Kingston will be playing each other on equal rest. Though Ottawa led the season series against Oshawa 3-1 earlier in the year, the Generals have won the last two meetings. As the teams get set to meet in Oshawa on Sunday evening, Ottawa will be looking to avenge those two losses while adding another key two points in the standings. 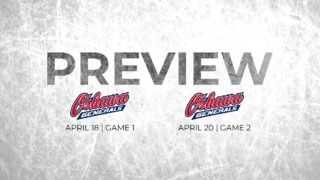 The Generals play the East-leading Hamilton Bulldogs the night before hosting Ottawa and will also be closing out a stretch of three games in three days. 67’s rookie Graeme Clarke broke out of an 11-game goalless drought on Sunday with an incredible, lacrosse-style goal that went viral. Defenceman Carter Robertson’s two-goal game last weekend gave the second-year player a new OHL career high in goals (3) and points (10). Tye Felhaber’s next goal will be the 70th of his OHL career. Defenceman Hudson Wilson is a team-best plus-9 on the season. Defenceman Noel Hoefenmayer will suit up for his 150th OHL game on Friday.